YONKERS – Come 2029, the city’s schools may be unrecognizable to those who know them today. Under a proposed 13-year, $2 billion overhaul, the district’s 39 buildings would be completely revamped, and two new schools added. That would be a far cry from a 2010 state survey that determined only two of them to be in satisfactory condition. As with similar school reconstruction projects in Buffalo, Syracuse and Rochester, the plan would require a special act of the state Legislature. Funds would be raised through the sale of bonds, which would be paid off by the city and state. The bonding could involve other entities as well. For instance, for the Buffalo project, bonds were issued by the Erie County Industrial Development Agency. Such large-scale school-reconstruction projects are overseen by local agencies called Joint Schools Construction Boards. The upstate cities issued bonds for some of the costs, but the state has picked up as much as 98 percent of the tab. The first phase, estimated at $500 million, includes building two new schools — on Ravine Avenue and off Ashburton Avenue — and replacing Gorton. The next three phases would focus on remodeling all the other school buildings and constructing additions. Yonkers’ school system of about 26,800 students is 4,100 seats over capacity. The average age of the buildings is 75 years, and two school houses date to the 19th century. Making Monday’s announcement at Gorton was no coincidence. 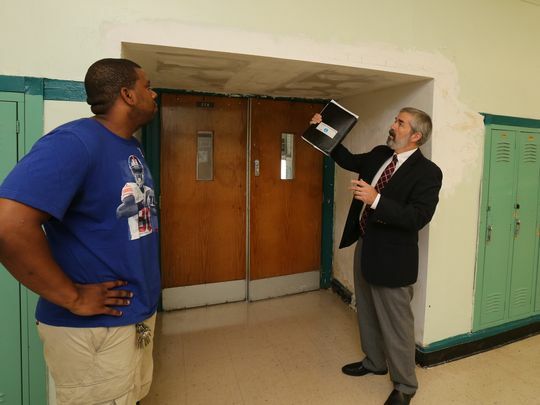 The school has become the symbol of the district’s crumbling infrastructure. Built in 1923, its boilers are nearly 60 years old and its windows — last replaced in the 1970s — are made of flammable plexiglass. Five years ago, 500-pound slabs of the school’s limestone gutters began falling to the ground. City officials estimated at the time it would cost $18 million to bring the school, at Shonnard Place and Palisade Avenue, up to date. Today, the price tag is $30 million. Two separate architectural assessments determined it would not be cost effective to make repairs. Gorton is essentially totaled. Interim schools Superintendent Edwin Quezada said his vision for Yonkers’ future encompasses every level of the education process. State Senate Minority Leader Andrea Stewart-Cousins, D-Yonkers, said she would help lead the charge in Albany. The state approved the first big-city project in 2000, with work beginning three years later to rehabilitate 48 Buffalo public schools. It took more than a decade and cost $1.4 billion. In 2006, Syracuse got approval for the first phase of its project, which ended last year and cost $156 million. The second phase, now underway, will reconstruct up to 15 schools and cost $300 million. The four-phase Rochester plan, begun in 2007, calls for reconstruction of 38 schools. It is the largest public works project in the city’s history, and will cost $1.2 billion over more than 12 years. Officials cautioned that upstate cities had an easier time gaining approval because they were eligible for the state to reimburse more than 90 percent of their costs. Yonkers would get a lower reimbursement rate — currently 70 percent — because state formulas take the higher property values in Westchester County into account. Yonkers officials said they were hoping to present the proposal to the state Legislature in the coming weeks, and plan to ask for 98 percent reimbursement. The proposal includes a social media campaign with a website, rebuildyonkersschools.com, and Twitter handle, @rebuildYPS.